Well, I've spoiled you with this one. Night Through is an amazing collection the guitar demi-god spread over 3 discs. There is a ton of different stuff spread over these 70+ tracks, from his americana-style pickings to the weird-experimental avant-garde sound to the sublime ambient stuff he is most known for now. I would never call this collection essential, because it is a lot of music, and I can rarely digest even half of it. But I will tell you that all of it is excellent. A truly unheralded legend, introduce yourself to Loren Connors. Not too many instrumentalists could put together a three-disc set of music released on 7” singles, but Loren Connors (aka Loren Mattei, Loren MazzaCane, Loren MazzaCane Connors – and we’re just talking the names that appeared on these singles) is not your average instrumentalist. Inspired by Mark Rothko, J.S. Bach, and most of all the blues, Connors has been pursuing his art constantly since the Carter administration; he would press his own LPs in batches of 50 and glue pictures on their sleeves before labels wised up and clamored to release his records in the late 1990s. 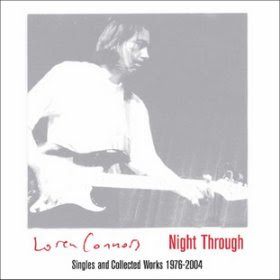 That flow of records has slowed in recent years, with only one 7” released since 2000, but the previously unreleased material on the third disc of Night Through shows that Connors is still searching and changing. Loren’s music works well in short doses; some of his singles only had music on one side, but I never felt short-changed when I bought one. The temporal confines seemed to focus his attention, bring him right to the point. But even on a little vinyl platter, he indulged a penchant for musical narrative; “Deirdre of the Sorrows” moves through four discreet movements in five minutes. Such works necessarily lose a bit of their stand-alone impact when you hear them as part of an hour-plus program, or when you go straight to them with a button rather than dig 'em out of the box, take 'em out of the sleeve, and put 'em on the turntable. But they gain something else. Thanks to mastering engineer Jim O’Rourke, many of these tracks sound much more present than they did crammed onto often crackly vinyl. Night Through’s mostly chronological presentation charts Connors’ artistic maturation and subsequent efflorescence. He moans over careening acoustic slide licks on the set’s earliest recording, a previously unissued cover of “Come On In My Kitchen” from 1976. There was too much obvious effort in his music back then; when he pressed up the earliest release of this set, “Ribbon of Blues,” 10 years later Connors had already reined in and amplified his playing, and his voice was well in the background, soon to disappear completely. By the time of his next EP, “Mother & Son” (1992), Loren had distilled his music into a force of evocation rather than display; the notes are sparse and short and always bent, implying the tenderness and ache of bonds between parent and child rather than shoving your face in it. Around this time Connors learned that he had Parkinson’s disease, which forced him to further pare back his playing, and also accounted for the sheer volume of music that poured our of him for the rest of the decade – he didn’t know how much time he had to make it. It also forced him to pick his notes carefully, since he could no longer play so many of them. He has explored various themes; his Irish Catholic heritage, the streets of New York City, universal and specific experiences of loss, even his bad relationship with canines. He has also explored different techniques; his clean-toned early-'90s playing is worlds away from the echo-laden wah-wah cries on the previously unreleased “For Miles Davis,” which was recorded in 2004, but they’re still unmistakably the work of one man. Disc one includes one suite from 1996, “Battle of Clontarf,” that never made it to disc and counts as one of the great finds of this collection. His wife Suzanne Langille delivers a blood-thickening, hate-filled text on one track; her dry, tremulous delivery closely matched her husband’s playing, and her words perfectly captured the rage of the disenfranchised Irish. On the next, Connors rings out a fuzz-toned melody that sounds like a hymn sung from a wind-blasted, battle-torn hill. And on yet another, you can hear the distant sounds of dishes being done – Connors recorded nearly everything here at home, and his prolific output is partly the consequence of a readiness to do the work regardless. Just like a painter paints or a writer writes every day even though they are denied immediate contact with their audience, this player plays no matter what. The second disc is book-ended by temporally out-of-sequence pieces that offer glimpses of Connors’ roots. The opening duet with the more traditional singer Robert Crotty just shows how distant Loren was from the blues mainstream, even in 1981; his liberal use of dissonance and over-the-top vocalizing seems to tug Crotty from the back porch into some dark forest. It ends with “Peace,” a lamentation sung in 1959 by his mother in church while young Loren kicked at the pews. Her voice carries over the organ in a way that Loren’s own leads soar over his grinding accompaniment (like Bach, Connors likes counterpoint, and generally overdubs several guitar tracks to get it). In between are some of his best recordings: the dark, pummeling “Exile”; the dramatic, keening “The End, The Afternoon, The Light”; the sober restraint of “For NY 9/11/01,” which was originally released as a CD-R. His most recent single, the 2003 release “Moon Gone Down,” points to new directions; Connors uses field recordings of wolves and a menacing, reticent bass guitar instead of the old rhythm chords, which results in some of his sparsest and eeriest music. The third disc is essentially a bonus album; aside from a few compilation tracks, it’s all previously unreleased stuff, some of it pretty recent. There’s a titanic live cut by Haunted House, his late-90s rock band with Langille and members of San Agustin, and “I Love You Porgy,” a rare and uncommonly sweet dip into the standard repertoire. There are some recent explorations of the ghostly sound world that Miles Davis unearthed when he recorded “He Loved Him Madly,” even a tribute to the Dark Prince himself. Handsomely packaged and well annotated, Night Through gives another enduring and constantly evolving artist his due.